Zebra Stripes, Creativity, and God! I have been in Orlando, Florida for a week now working on a slew of writing projects. My co-author and friend, Mark Sutton lives in Orlando. I came here for a “writing week” to work on my fiction projects and to meet with Mark and work on our upcoming depression book. Most of the week I spent working on our “platform” to promote not only the depression book, “Conquering Depression” but also for my own fiction work. My wife had to stay home with her home bound mother (who lives with us) so there were many days I was totally alone and very “lonely”. It is in those moments that I tend to get depressed. For me, depression is a constant companion; a buried and mostly subdued beast that, like Jekyll and Hyde, tends to dominate my mood when my defenses are at their weakest. Fortunately, writing and creative endeavors tend to help push the beast back into its cage. I am currently sitting on the terrace overlooking a savannah. 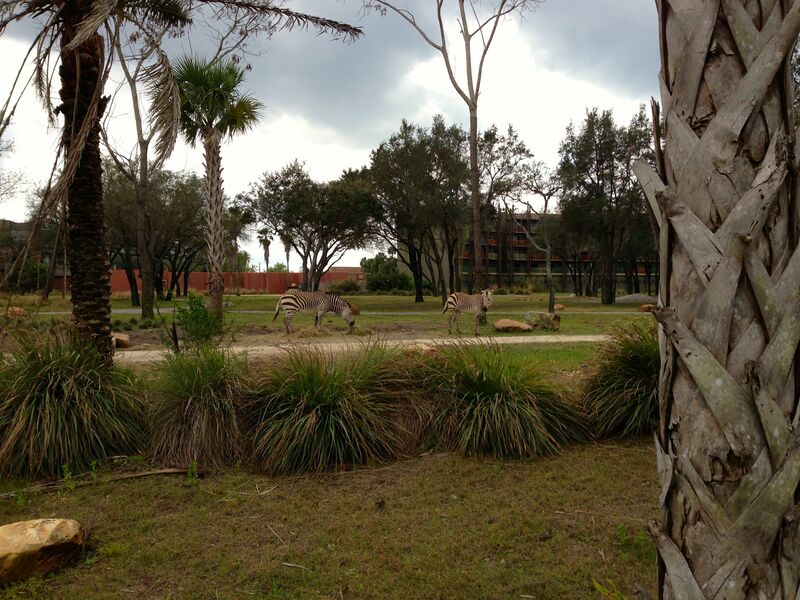 At “Kidani Village”, the Disney Vacation Club villas that are part of Animal Kingdom Lodge, there is a huge open savannah surrounded by the villas. It is populated by zebras, ostriches, Thompson’s gazelles, Bongo cattle, and wildebeest (no stampedes, please!). I am sitting in a rocking chair looking down upon three zebras engaged rather lazily in the process of eating what must be for them a scrumptious feast of grasses and grains. In the distance, the gazelles are doing what gazelles do best; leaping and frolicking. 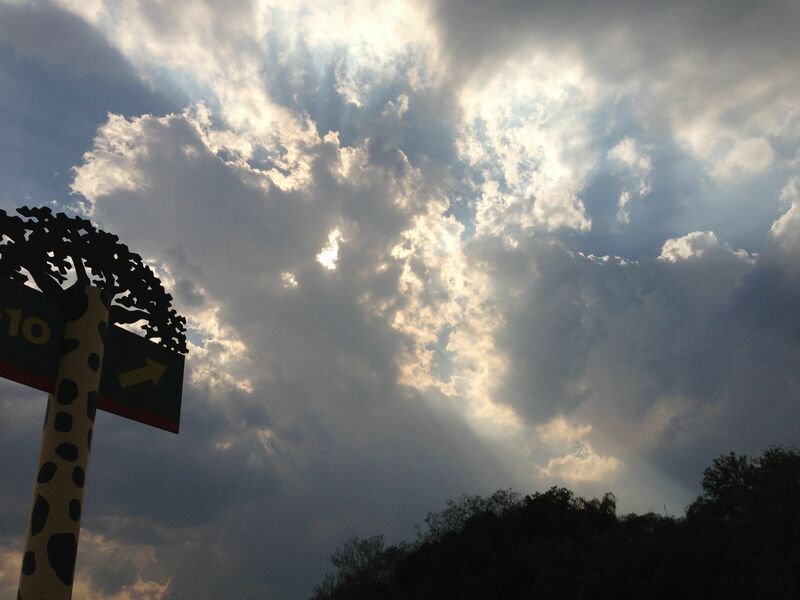 The sky is partly cloudy with an occasional cloud and drops of cold rain. The wind brings a balmy breeze in the upper 70s and it is truly relaxing. And, inspiring. I read an article a few months ago about the stripes on the zebra. The traditional thinking has always been that zebras have stripes to help them blend in with the savannah. But, as I watch them move in and out of brown and green grasses, I can’t imagine how the black stripes can blend in. I suppose to color blind animals, the black stripes against a pale brown grass wouldn’t make any difference. But, to me, the stripes just make them stand out. Here I am! Come and get it! Dinner is ready! But, an amazing scientific experiment has shown the true reason for the stripes. A group of biologists placed white placards with differing types of black and white patterns on them near a watering hole in Africa. The placards contained an odorless, tasteless adhesive. The goal was to determine what kind of insects and just how many insects were either attracted or repelled by the pattern. The discovery was amazing. The stripes of the zebra (and by inference, the tiger and other such striped creatures) tend to disrupt the normal visual pattern of the multi-faceted eyes of certain types of biting flies. In other words, the stripes are not there for camouflage. They exist to repel these flies. What an amazing development! Or, was it? You see, I believe that far from a mere development, the stripes are an element of design. I believe in a hands on God who designed these patterns for the protection of the zebra. I see the stripes as far more than just an evolutionary development. I see them as evidence for a caring, creative God of the universe. But, that is just me, I suppose. So, I will sit here a bit longer, reveling in the cool breeze, the occasional rain drops and the pleasing, relaxing movement of the zebras. And, in that process, I am closer to God than I was an hour ago! I am in Orlando, Florida meeting with my co-author, Mark Sutton. We are working on building a platform to promote our book, “Conquering Depression”. While I am supposed to be excited, I am also somewhat sad because my wife could not be with me. She is staying at home to take care of her mother. And so, I sit alone in a hotel room looking out over the grounds of the Disney resort, Port Orleans: Riverside. I have been her for four days now and the loneliness is telling at night. During the day, I have had the opportunity to spend time with Mark and his wife, Donna. But, now, I face another lonely evening with just me and my laptop. Odd that I should feel this way when working on a book about depression. For depression is the beast that hounds me, that breaths down my neck, that perches on my shoulders with steely claws waiting to dig into my muscles. If you suffer from depression, you know exactly what I mean! But, just now, I listened to one of my favorite songs by Jason Gray, “Good to Be Alive”. Hold on, Is this really the life I am living? In September, 2012 my son, Sean and I attended Hutchmoot 2012. During one of the most moving breakout sessions, Jason Gray shared his struggled with a depression so deep and so profound, he considered ending his life. His friend and colleague, Eric Peters also shared his struggle with depression. We were sitting in a room with about 35 people most of whom were in their 20s and I was shocked at how many of these young adults with their entire life ahead of them echoed these two singers’ struggles with depression. Right now, I should be on top of the world. I am on the verge of a new contract for a new book series. But, at the same time, I have been released from a five book contract and I don’t know what the future holds for my fiction. It is a time of difficulty decisions and uncertainty while I wait patiently for my agent to give me advice regarding the future of these books and my career. It is so easy to forget the positive and dwell on the negative. But, I must continue to remind myself the reason I write. Not only is it cathartic, but it is revelatory. God speaks to me as I write and the words that show up on this page are a reflection of God’s working in my life. They are an echo of the work that God has for me to do. In that respect, it is “good to be alive”. Because I want to live like there’s no tomorrow. I want to love like I’m on borrowed time. I won’t take my life for granted another second. I will not waste these moments that God has given me. I will wait upon the Lord for He knows the plans for my life. And, I am grateful that God has given me a tiny piece of His Story to write! Did You Check Your Brain at the Door? I grew up underneath this narrow umbrella as a Southern Baptist in a small town. My father was a bivocational music minister so I was at the church literally ever time the doors were open. I grew up immersed in the stories of the church. But, there was an unspoken rule that permeated my every encounter with God and the Bible. Don’t question the Bible! Don’t think! Just accept everything by faith! My understanding of “faith” was basically blind belief. I was supposed to accept what the Bible says because it can’t be proven. No wonder my colleagues in science laugh at the Bible! It is nothing but a bunch of fairy tales. Might as well base your life on Grimm’s fairy tales or Walt Disney’s animated shorts from the 1930’s. True, there are some morals to be learned, but to think the stories were real? Come on! Modern day Christians have no one to blame but ourselves. We built this castle of stupidity and now we defend it with great fervor and animation. Let me tell you a story. It is 1925 and the town of Dayton, Tennessee has fallen on hard times. Economy is bad. Really bad. One of the town officials notices an ad in the paper placed by the ACLU. The ad offers to pay for any trial that challenges the “Butler Act” forbidding the teaching of evolution in high school. The official sees the opportunity to bring fame and fortune to Dayton. Problem is, they have to find a teacher who has violated the law and have that teacher arrested. The local high school biology teacher refuses. But a man by the name of John Scopes has been filling in as a substitute teacher and agrees to admit he taught evolution during one of his brief stents as substitute teacher. So, he is arrested while playing tennis and taken into custody. Enter H. L. Mencken. This famous American writer and reporter worked for a paper in Baltimore and saw an opportunity to promote his ideas regarding the superstitious nature of religion. An avid follower of Friedrich Nietzsche, he was an avid non-believer. He asked the famous lawyer, Clarence Darrow to take on the case because of his low popularity after representing the kidnappers of the Lindberg baby. Mencken had a very narrow agenda. He wanted to prove that anyone who doubted evolution, and by inference, science in favor of a superstitious belief in God was “anti-intellectual”. Thus was born and reinforced the idea that all Christians are ignorant, superstitious, uneducated individuals. This stereotype has been perpetuated in the movies, television shows, books, and in the media. And, frankly, we haven’t done much to dispel this impression! The New Testament concept of faith is based on the Greek word pistus. It’s meaning: to trust in something for which we have seen the evidence. Evidence! That means we have to think and analyze the evidence. Faith is NOT blind belief. Does the Bible imply that we should never think on these things? NO! In fact, Jesus set the example of how to think and analyze the thoughts and actions of his enemies before responding with deeply thought out philosophical “arguments”. 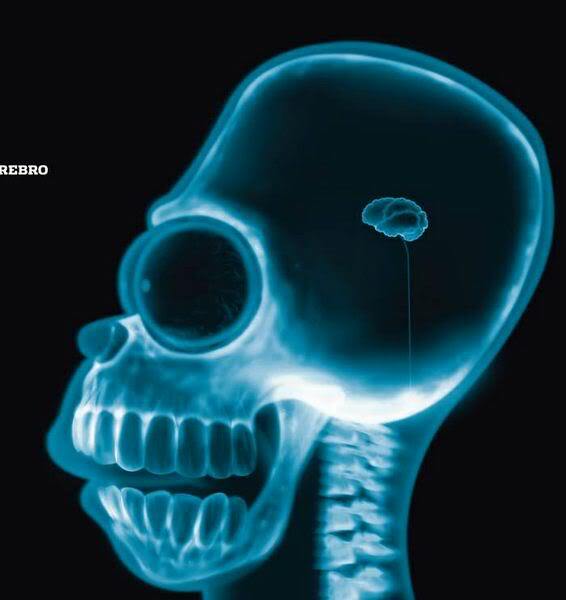 So, go pick up your brain and take it with you everywhere you go and show the world that Christians can think and have the only worldview based on real events, real people, and sound history, science, and philosophy. That is the only way we can begin to change today’s culture! Why, why, why do I Write? It is a dream I have had since I was 13. My first published work didn’t occur until I was 40. But, during the intervening years I wrote over 100 plays performed by the drama team at my church. Now, I have two fiction books published by Realms. I have a book on depression that has been in circulation since 2001. There is a possibility my co-author and I will have a new book deal today and possibly a book series to write. I have tasted rejection too many times to remember. I have a framed letter of rejection signed by Isaac Asimov from a story I submitted to his magazine in 1973. I have self-published two books. I have been “released” by my latest publisher. I have been through two agents and I am now no my third agent. I have been duped, hornswaggled, conned, ripped off, and taken advantage of by more publishing schemes than I can remember. But, I still have my day job and I plan on keeping it. So, I am sitting here on the balcony of a condo overlooking the emerald green waters of the Gulf of Mexico wondering why I keep doing this. Below me, an eager, fresh faced kid has scrawled in the white sand “Don loves Joanne” with the word “loves” represented by the image of a heart pierced by an arrow. Beside those huge words is a fading admonition from another love stricken person, “Bye Retta”. The letters are barely visible having been filled in by the fierce winds of the last three days. I am very much aware that my work as a writer is much like the latter. It will fade with time and no one will remember a word I have written after I am long gone. Although I am thinking positively, there is the distinct possibility that every word I have ever written will be gone shortly after I am gone. My name may never grace the halls of fame along with Isaac Asimov or Ray Bradbury or Mark Twain. Why do I keep writing, then? Why do I lose sleep at night constructing the latest story. Why do I watch people and try to discern what makes them tick so I can create a new character? Why do I sit in misery trying to plan my next step now that I have been “released” by my publisher? Why, why, why? Reason #1 — I realized early in my life that God had given me a gift, or a curse, however you look at it. I can’t not write. And here is the thrust of what God has shown me. I have NEVER been able to be successful as an author by writing the story that I wanted to write. I have only been successful when I wrote the Story that God wants me to write. This has required me to redefine the word “successful”. It’s not about money. It’s not about fame. It has to do with Reason #2. Reason #2 — At the recent Platform conference, I was pleased to hear over and over again that if a person focuses on changing people’s lives, they will be successful. Touching one person’s life in a positive way can NEVER be reduced to a dollar figure. My good friend Chan told me once, “I don’t always get to be the closer. But, I will put a rock in their shoe.” There are times I get immediate feedback from something I have written and I learn that someone’s life has been altered in a good way. But, I will never see the end result of that tiny alteration. Only God knows how that ripple will change a person’s life way down the line. With our depression book alone, Mark Sutton and I have received countless emails telling us the book “saved my life”. You cannot put an earthly value on that! It has eternal value only. And, my friend, when I realize this, I can only rejoice that God has used something that came out of my brain to change the course of someone’s life. But, that “something” didn’t happen in a vacuum and that brings me to Reason #3. Reason #3 — Every successful endeavor that has occurred in my life was totally unplanned. In fact, the plans I had for my life have never come true. But, the plans that God has for my life have come true. Over and over and over. Time and time again, doors opened; windows opened; opportunities fell into my lap; “coincidences” happened. And, when I followed the voice of God, my endeavors have always been a success. I never planned on having depression. God turned my experience into a book that has changed lives. I never planned on writing drama. God took those stories and changed people’s lives. I never planned on having such deep doubts about Christianity that I would become an apologist. God has taken my teaching and has changed lives. Why do I write? Because it is God’s mission for my life. And, as long as I seek to be a part of the Work that God has for me to do Today, then I will continue to be “successful”. Successful, not in the world’s view, but in God’s view. I have always said that a person should seek to be involved in something that will outlast his life; something that will have eternal consequences. I am hoping that one day, when I am sitting at the feet of Jesus in the Beyond someone will put a hand on my shoulder and thank for me that play I wrote or that book I wrote or that blog post. And, there is no earthly reward to even begin to compare to that! 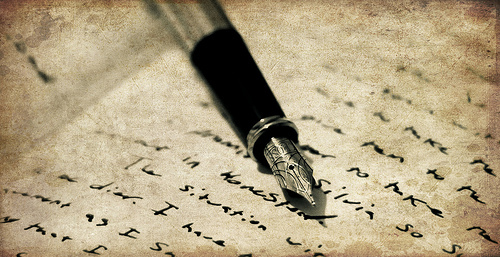 Tell me — Why Do You Write? Why Do You Indulge in Your Passion? I decided to take Sherry to the beach for a week in March. She needed a break from responsibilities and stresses at home. We had no idea it would barely get out of the 40’s our first day here! 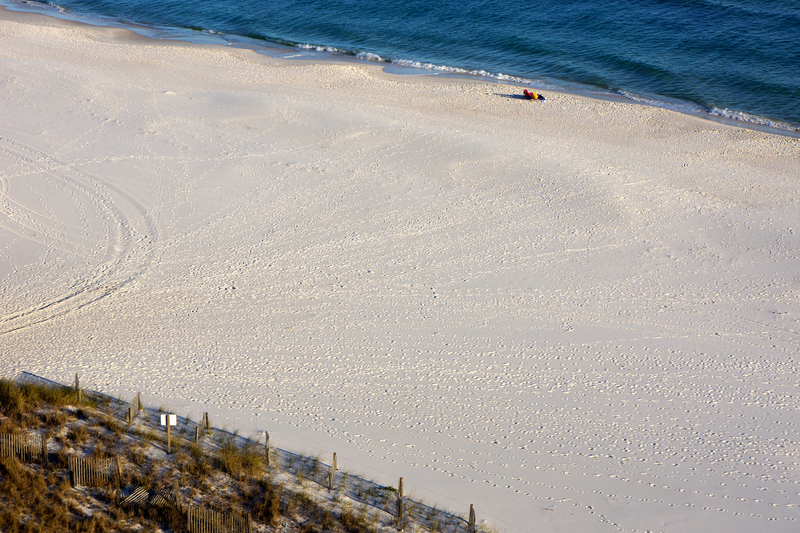 Gulf Shores, Alabama is a place near and dear to our hearts. We have vacationed in this area many, many times before. 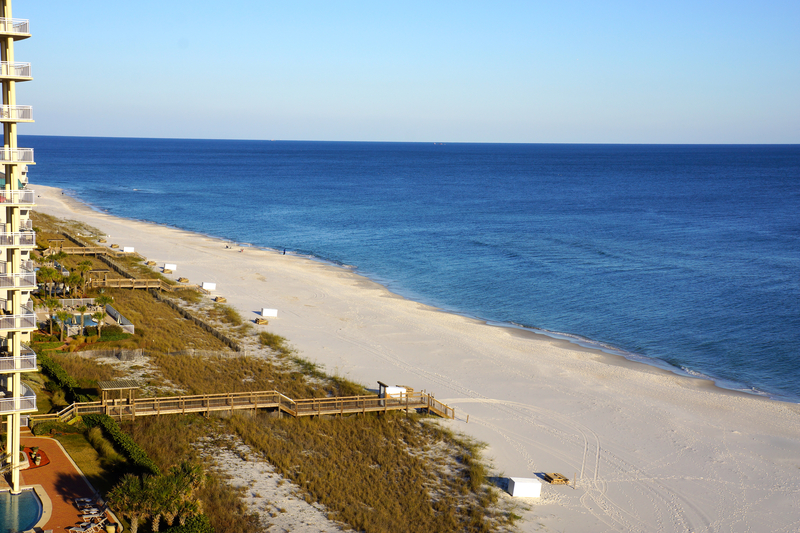 Lately, we’ve been staying just a few miles down the beach just over the state line in Perdido Key, Florida. Just to show you how cold it is, take a look at these pictures from our balcony. The beach is deserted!!! But, what I wanted to share was a story of a beach house. I first saw this beach house in 1999. 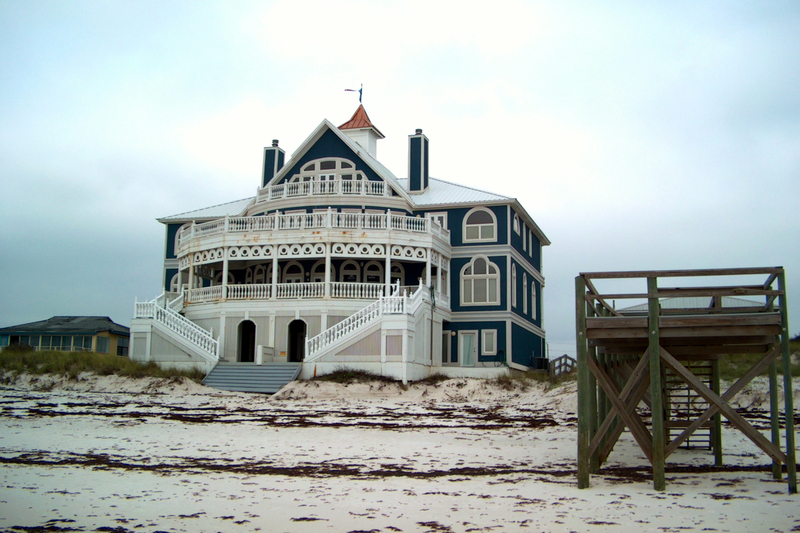 It was August and we were staying in Orange Beach, Alabama (part of the Gulf Shores area) and I walked down the beach and saw this house. 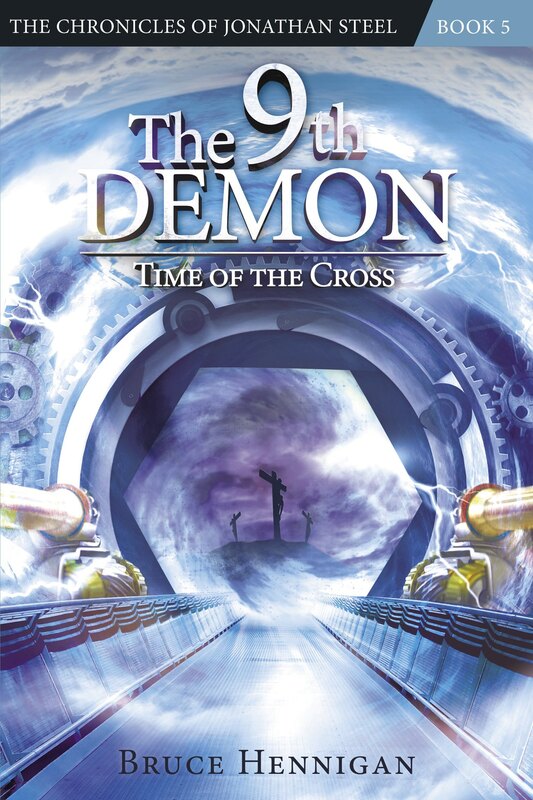 The week before we left to come to the beach, I had begun the rough draft of a novel that would become “The 13th Demon: Altar of the Spiral Eye”. I was 16 chapters into the book when we arrived at the beach. After an evening walk down the beach with my wife, I saw this house. It was huge. And for some reason in the fading, gray evening, it creeped me out. So, naturally, I put it into my story. If you have read the first book, you know that this is the beach house where Jonathan Steel completed his physical recovery after waking up on the beach tortured to within an inch of his life. It was this house owned by the love of his life, April Pierce that would haunt him and in the books, haunts him still. You see, there is a secret hidden in this house. It is a secret those of you who have read my first two books know nothing about. That secret will eventually be revealed in later books. I hope to continue to write the Chronicles of Jonathan Steel and at this moment I am currently looking for a new publisher. 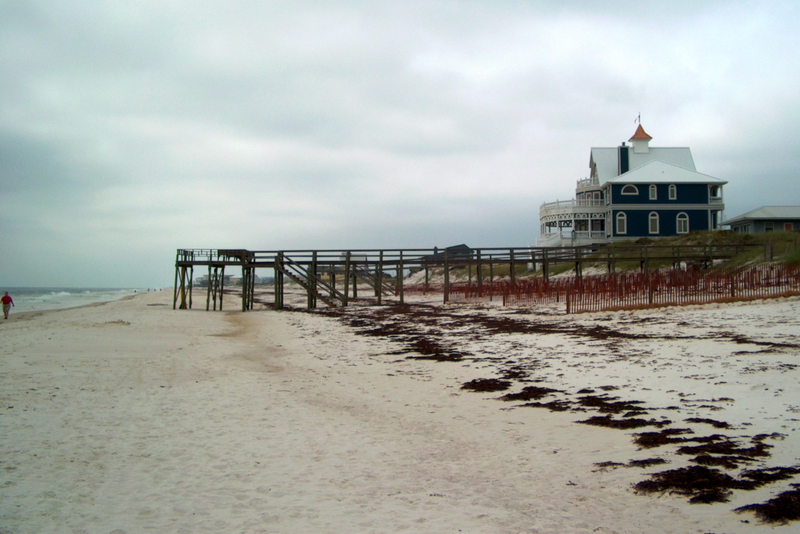 In 2004, Hurricane Ivan took out this house along with much of Orange Beach. It no longer exists. Today, I walked down that cold, empty beach and I missed the house that inspired the story of Jonathan Steel. It now only remains in my imagination along with a picture or two. And, of course, the real owners miss it also!